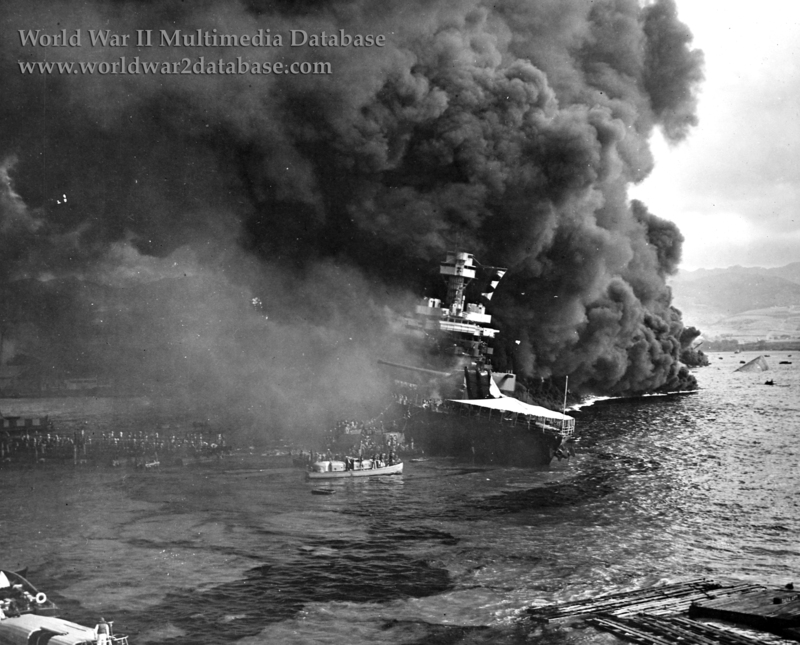 The crew of USS California (BB-44) abandons ship under fire as burning fuel oil from Battleship Row engulfs the ship at 1000 Hours on December 7, 1941. The capsized hull of USS Oklahoma (BB-37) is visible at the right. California was hit by her first torpedo around 0805 Hours forward of Turret One. A second torpedo hit at 0820 after of Turret Three. At 0840 a bomb rocked the ship, killing fifty sailors, and she began to list; some of her watertight integrity failed and bulkheads were left open for inspection. She began to list. Turrets Two and Four were trained to starboard to compensate for the list to no avail. By 0855 California's black gang had restored power, and the crew attempted to fight the Japanese aircraft, the fires, and the flooding all at the same time. Burning oil drifted from the stricken ships along Ford Island and made the crew's efforts untenable. But within a few minutes the wind shifted and blew the oil fire away from California; but it was too late. The boilers had been put out when the abandon ship order was given and could not be restarted because of the oil-contaminated water. by the afternoon of Sunday December 7 the list reached sixteen degrees. Several tugs and small craft came alongside to fight the fires with carbon dioxide so that more water wasn't added to the flooding. The combined pumping capacity of the small craft were outpaced by the flooding. Plans were made to cut away guns and the ship's masts to prevent her from capsizing like USS Oklahoma (BB-37) did. Working through the night, California's list was stabilized, but she settled to the bottom on December 10. She was refloated in March 1942 and restored to service in May 1944.